The safeguarding of our pupils, parents & staff is of the utmost concern to us here at Hutton CE Primary School. 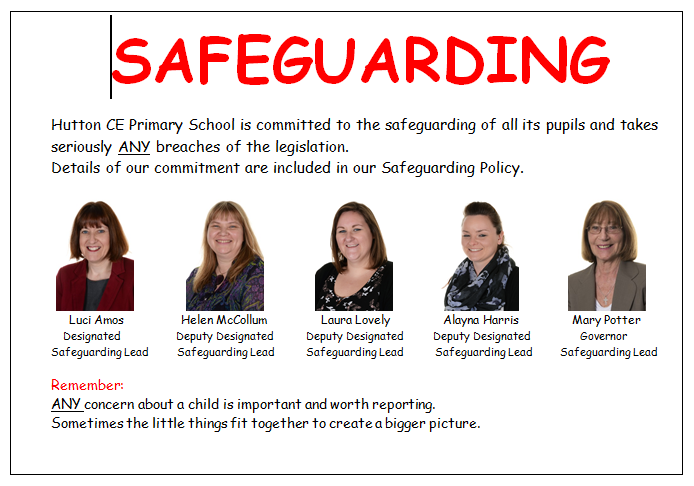 If you feel that you have any safeguarding concern to report, please speak to either Mrs Luci Amos or Mrs Helen McCollum. If neither are available, please do still report your concern to Mrs Rachel Whiting, Mrs Jane Storer, Miss Alayna Harris or Mrs Laura Lovely, or your class teacher. If your concern is out of school hours, please contact North Somerset Safeguarding Children Board.